Rob Franken (1941-1983) was a unique jazz pianist from the Dutch port city of Rotterdam. He was self-taught and developed a unique technique and improvisation style. Already in the sixties he accompanied great jazz luminaries such as reed player Booker Ervin, trumpet player Art Farmer, vibraphonist Dave Pike & drummer Klaus Weiss. He was a pioneer on the Hammond organ and was the first in the Netherlands to play the Fender Rhodes electric piano. In the seventies he became a popular and highly sought after pianist. For more than ten years he was the regular accompanist of the world-famous harmonica giant Jean 'Toots' Thielemans, whom he also accompanied in the film music of ‘Turks Fruit (Turkish Delight)’ . He appeared on hundreds of records as well as being a member of the Rogier van Otterloo orchestra, the German big band of Peter Herbolzheimer, and the Dutch funk-fusion band Scope. Until his premature death, he pioneered and experimented with synthesizers, seized by the new possibilities and timbres. 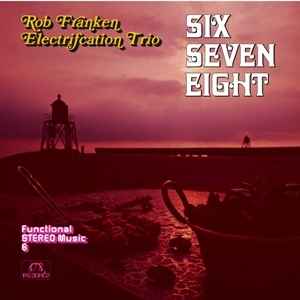 Franken also had several different formations, including The Rob Franken Organ-Ization, Keyboard Circle as well as his own trio and quartet. Franken arranged the sessions, played Fender piano and synthesizers and drew from his immense network of musicians to collaborate with. The repertoire consisted mostly of jazz standards, pop songs, pieces by Frankens's musical heroes and several of his own compositions. In truth, they were often nothing less than inspirational short jam sessions, in which the best Dutch jazz musicians of the seventies contributed. When Rob Franken unexpectedly passed away at the age of 42, this enormous production came to an abrupt end. The FuMu recordings of Franken were fortunately saved by the producer at the time. And so, it gives us great honour at 678 records, to present an exclusive choice from this enormous library of 'functional stereo music'. DJ's P-Dog & Zembie (AKA Sander Huibers & Frank Jochemsen) have compiled some of the best tracks, dirtiest breaks, funky compositions, fat bass lines, and especially exuberant keyboard work by Franken. Compositions of Billy Cobham, Weldon Irvine, Michael Naura, Marc Moulin, Gordon Beck, Chick Corea, Herbie Hancock and of course Rob Franken himself.